New York presented by year - 1500 to today - history. Here we present New York during different years. The area around New York has been inhabited in over 11.000 years. This was earlier land of the Indians and were shared by several different Indian tribes. The earliest inhabitans called themselves Lenape - so-called "the people of the area". One trace from the Lenape Indians is today Broadway on Manhattan, it was earlier an old footpath. Francis I of France who wanted to find a new way to Asia, to increase the trade business. The English explorer Henry Hudson (1565– 1611) get a mission from the Dutch East India Company to find a new passage to the west. At this time the Company has the monopoly on the trade with the Orient and wanted to shorten the travelling time, they wanted to to find a new way there. He explore the area around a mouth of a river, who he later will give his own name to - Hudson river. He reported home about the beatiful harbour, river and the fertile soil and the peacfullness temperament of the Indians. Furhunters from Europe settles in the area. I a court decision in Amsterdam Dec 23 1623, the right is given to the Dutch West India Company to prevail over the area at 38 and 39 latitude, who at this time sends over the first Dutch settlers during 1624. With captain Cornelius May, the first settles arrives with the ship "New Netherland" to New Netherland in June 1624. Cornelius May also becomes the first leader of New Netherlands. Fort Amsterdam are built at the south side of Manhattan 1625, who later on becomes New York and today it is the area Battery Park. The fort should protect the inhabitants from Englishman and Frenchman. Peter Minuit - director-general in the Duch West India Company (1626-1633) buys the Island Manhattan of the Lenape Indians (also called the Manahatta Indians) 1626 for Lenape Indians worth 60 gulden (approx 24 USD, in todays currency approx 500-700 USD). 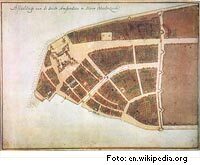 The Duke of England´s troops occupies New Amsterdam completely surprising and the area change name to New York. The Dutch reclaims the area and now calles the city "New Oranien". Feb 9 - The Englishman conquests the area. 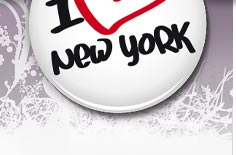 Feb 19 - Englishman and Dutch signs the peace in Westminster and the area agin becomes New York and English. American Revolutionary War (The American revolution). become one of 13 states. The Declaration of Independence. England acknowledge the 13 states independence and the peace document is written. New York is the capital in the US. president oath outside Federal Hall - beside Wall Street. Washington´s birthday - Feb 11 - is today a public holiday and is celebrated as Presidents' Day, the third Monday in Feb. Newspaper New York Times are founded by Henry Jarvis Raymond and George Jones. Brooklyn Bridge is opening - worlds largest suspension bridge (486 meter). The Statue of Liberty inaugurates. The Statue is a gift from the Frech people to the american people as a symbol for both countries friendship during the american revolution. The Statue is standing on Liberty Island in the harbour of New York. approx 14 millions immigrants between the year 1892 - 1924.